If you like do-it-yourself projects, you can learn how to build an Adirondack chair and have it assembled in one day. These popular outdoor chairs are surprisingly comfortable and their unique, compact design makes them more portable than larger chairs and benches. How Difficult Is Building an Adirondack Chair? Unless you're an experienced carpenter or woodworker, building an Adirondack chair from scratch could prove to be quite difficult. 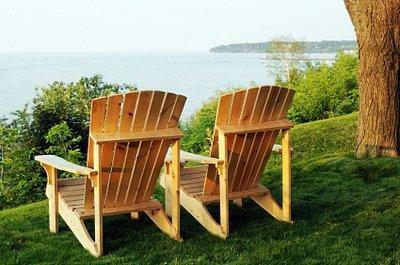 There are many different plans for building Adirondack chairs online. The plans require buying different sizes of cedar planks or pressure-treated decking. You must be familiar with using a jigsaw or circular saw to cut out all the different shapes and sizes of wood needed to assemble the chair. You also have to accurately drill all the holes needed for the screws that hold the chair together. The problem with some plans and instructions on how to build an Adirondack chair is that they can often be vague or complicated. Most plans fail to disclose the level of difficulty associated with constructing an Adirondack chair, especially for beginners. The best solution for saving time and a headache while building your own Adirondack chair is to purchase an Adirondack chair kit. An Adirondack chair kit has all the materials you need to build your chair. The wood pieces are all pre-cut and shaped for you and the kit also includes all the hardware needed. WoodNewEngland.com offers two different types of kits based on skill level. Basic kits involve more steps to complete the chair and ready-to-assemble-kits have done most of the work for you. With both kits, it is recommended that the finished chair be treated with a waterproof wood sealant to protect and prolong the life of the wood. These kits contain cypress or mahogany wood. What Type of Wood Works Best? An important consideration when choosing a kit to build your own Adirondack chair is the type of wood the kit comes with. Many types of wood will make an attractive Adirondack chair. However, since these are outdoor chairs, there are preferred choices of wood that have advantages over other types of wood. Cedar is commonly used for making outdoor furniture. Cedar is naturally resistant to decay and insects. It is a very durable wood that can withstand exposure to harsh weather. Cedar wood dries rapidly because of its cell structure and this makes it resistant to moisture rot. The naturally occurring organic compounds that give cedar its pleasant aroma to people acts as a deterrent to wood eating insects. You can treat cedar wood with a sealant to preserve its natural color. When left untreated, cedar wood weathers into an attractive silver gray color. Northern White Cedar and Western Red Cedar are the top choices for beautiful outdoor furniture. Cypress wood is another good choice for an Adirondack chair. Cypress is sap-free, so it takes well to sealers, stains and paint. Cypress trees produce an oil called cypressine, which acts as a natural preservative so that cypress can also be left untreated to weather to a light pewter color. There are some great resources online for ordering a do-it-yourself Adirondack chair kit. You will need to visit each site and determine which style of Adirondack chair you like the most. Some sites refer to Adirondack chairs as "Bear Chairs." GoneCoastal.net offers free shipping to the continental United States.